The pearl of the dragon represents the sun and wisdom. The pearl is carried by a dancer and is used to lead and charm the dragon. The movement "dragon chasing the pearl" shows that the dragon is continually in the pursuit of wisdom. The Dragon dance is always a revered performance that attracts great crowds. Dragon Dance is the fierce and explosive movement of several people controlling the massive body of the dragon. The serpentine movements require speed, coordination, and power, which in all bring the majestic creature to life. 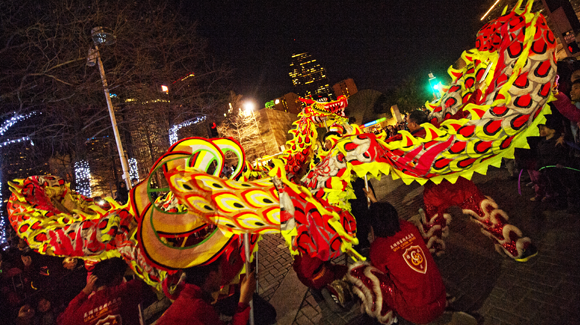 Dragon Dance used to be called the “Dance of the Dragon Lantern”. It was a very gentle dance with few movements. Gradually, more dance steps were added, making it a robust and exuberant dance. The Chinese who have shown great belief and respect towards the mystical animal started the dragon dance. Dragon Dance has spread throughout China and to the whole world. It becomes a special performance of arts in the Chinese physical activities. It symbolizes the bringing of good luck and prosperity in the year to come for all the human beings on earth. According to ancient history, during the period of Chun Chiu, the learning of Chinese Martial Arts was very popular and in the spare time, dragon dance was also being taught to students to provide more encouragement. We also offer classes in Dragon Dance. Whereas Kung Fu and Tai Chi are primarily solo exercises, Dragon Dance place specific emphasis on teamwork. Maintaining precise coordination of performers and musicians is key to creating a lively, exciting performance. Students of JK Wong Academy are invited to participate in these classes free of charge and are expected to take part in our numerous performances throughout the year. Click here to see our Dragon Dance class schedule. For the past 30 years, the J.K. Wong Dragon and Lion Dance Team has performed thousands of shows at community events, festivals, grand openings, restaurants, supermarkets, schools and universities, corporate events, private parties, weddings, diversity days, and many more! The team also performs outside the United States including China, Malaysia, Singapore, Thailand, and other countries. If you have questions about hosting the Chin Woo Lion & Dragon Dance Team to perform, you may contact us for details. If you would like to know more about Lion Dance and its rich traditions, click here to see our comprehensive Lion & Dragon Dance website.